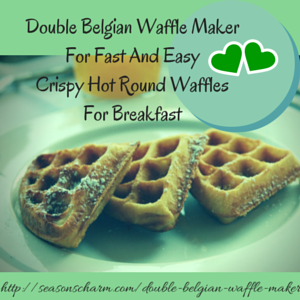 The double Belgian waffle maker is a useful kitchen appliance to have. It makes a super quick breakfast before you rush off for work in the morning. It is definitely an ideal as well as a useful housewarming gift for families with kids. 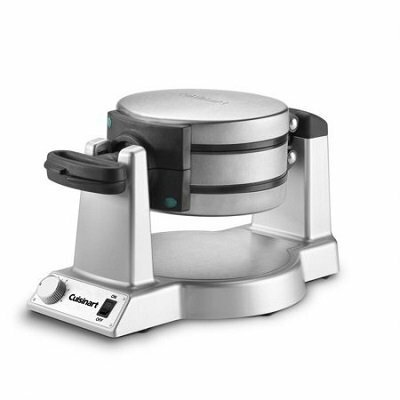 The Cuisinart Double Belgian Waffle Maker Round, Stainless Steel (WAF-F20) has a number of great features. It is great if you prefer your waffles to be thicker compared to the thinner traditional style waffles. Thicker Belgian waffles make a substantial breakfast. This double Belgian waffle maker comes with round shaped waffle plates and has a 6 setting browning control knob for cooking to your desired level of brownness. Being able to bake 2 round waffles at the same time means that larger families can enjoy hot freshly baked waffles together. There is no waiting for the next batch to be ready, a great time-saver when you’re rushing in the morning. Anyway, even if you have to wait, it takes only about 3 minutes for another batch of crispy hot waffles to be served. Another great advantage of this double waffle maker Cuisinart is that you can bake a soft textured waffle on one side and a crispy one on the other side. This 1400 watt 120V round Belgian waffle maker machine comes with 1″ deep pockets, a rotary thermostat and 2 LED indicator lights. You can easily control the degree of golden browning by turning the browning control switch (6 settings). Get the perfect crispness that you like by adjusting the cooking time. The amount of batter used and the browning control button helps in getting the perfect crisp that suits your taste. The rotating or flip feature (flips 180°) ensures that the waffles on both side of the machine get to be baked evenly. 3 audio beep tones alert you when baking is completed. This means that you can attend to other cooking stuff and not have to worry that you’ll forget about the waffles and end up getting them burnt. Having a non-stick surface means that the batter does not stick and it is easy to clean. The Cuisinart waffle iron is light and portable, you can even take it with you when going on holiday. It measures 15.50″ L x 9.75″ W x 9.30 H”. An ideal housewarming gift for families, the Waring Pro double Belgian waffle maker is a winner.